China is the biggest nation in size and population in Asia. Currently it has the world’s second largest economy. It has disputes over the Senkaku islands in the East China Sea and with a number of ASEAN countries on the South China Sea. The South China Sea is bounded by China in the North, the Philippines in the East, Vietnam in the West, Malaysia as also Brunei in the South East and Indonesia in the South West. The area bounded by the Sea is approximately 3, 685,000 Square km and forms a part of the Pacific Ocean. The area includes more than 200 small islands, rocks and reefs with many of them located in the Paracel and Spratly chain of islands. 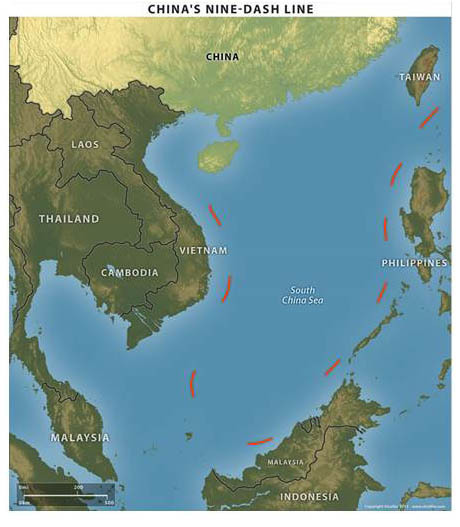 The South China Sea is a highway for trade, shipping and telecommunications. The route is used by all ships heading from the Straits of Malacca to Japan, China, Cambodia, Vietnam, Malaysia, Philippines and Brunei. Thirty three percent of the world trade and 50 percent of world’s traffic in oil and gas pass through the South China Sea. It is a source of fish and is expected to be rich in hydrocarbons. Oil deposits have been found in most of the littoral countries of the South China Sea. The region has proven oil reserves estimated at about seven billion barrels and oil production in the region is currently around 2.5 million barrels per day. Natural gas reserves are estimated around 266 trillion cubic feet. Being an enclosed area, there are difficulties with regard to conflicting claims by various countries. Prior to analysing the claims of affected countries, it is important to understand the UN Law of the Sea. The 1982 Convention on the Law of Seas has numerous guidelines pertaining to islands, the continental shelf, enclosed seas and territorial limits. Pertinent articles as applicable to this dispute are Articles 3, 55-75, 76 and 121. Article 3 establishes that every state has the right to establish the breadth of its territorial sea up to a limit not exceeding 12 nautical miles. Articles 55-75 explain the concept of Exclusive Economic Zone (EEZ), which is an area up to 200 nautical miles beyond and adjacent to the territorial sea. The EEZ gives coastal states sovereign rights for the purpose of exploring, exploiting, conserving and managing the natural resources. Article 76 defines the continental shelf of a nation which comprises the sea and subsoil of the submarine areas that extend beyond its territorial sea throughout the natural prolongation of its land territory to the outer edge of the continental margin, or to a distance of 200 nautical missiles. This is significant as it allows every nation to exploit the continental shelf. Further, Article 121 states that rocks that cannot sustain human habitation or economic life shall have no EEZ or continental shelf. In the case of South China Sea, most of the claimants have established military outposts in order to conform to Article 121 in pressing their claims. The Convention also states that overlapping claims must be resolved in good faith. The South China Sea contains over 250 small islands, atolls, shoals, reefs and sandbars most of which have no indigenous people, many of which are naturally under water at high tide and some of which are permanently submerged. The islands are located on a shallow continental shelf with an average depth of 250 metres. However, in the Spratly chain, the depth changes tremendously and near the Palwan trough is more than 5000 metres deep. The sea floor contains Paleozoic, Mesozoic granite and metamorphic rocks. Out of the entire group, only one island is volcanic, otherwise the islands are made of coral reef. There are no native animals except boobies and sea gulls. There are numerous territorial issues in this region. Some of them have been settled or what could be termed as partially settled. China is the principal claimant and in the last two years has become more assertive. The first to be dealt is the Natuna islands which contain Indonesia’s natural gas fields. The area had no dispute till China released an official map with maritime boundaries including these islands. Indonesia responded by conducting a large naval exercise in the region in 1996. Since then China has not voiced any protest and drilling of natural gas continues unabated. Similarly Malampaya and Camago natural gas fields of Philippines are claimed by the Chinese. However, they have not objected to the drilling of gas. Further, many of Malaysia’s natural gas fields located offshore Sarawak is claimed by the Chinese but Malaysians are drilling with no objection from the Chinese. Vietnam and China have resolved the Gulf of Tonkin dispute and similar issues have been resolved in the Gulf of Thailand. 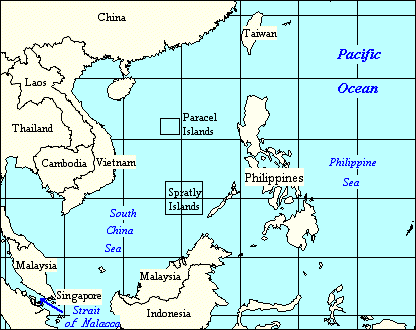 The present dispute mainly pertains mainly to the Paracel and Spratly group of islands. Parcel Islands were occupied by China in 1974 when Vietnam was fighting a war with the United States. Both these island groups are disputed and are claimed by countries of the region. Brunei reportedly claims area of Louisa bank and Rifleman bank near Spratley chain as part of its continental shelf. Philippines claims 53 of the maritime features in the Spratley Islands which it calls the Kalayaan island group as well as the Scarborough Shoal. Similarly, Malaysia reportedly claims sovereignty over 11 maritime features in the Spratly Islands. Vietnam claims sovereignty over all the maritime features in the Paracel and Spratly islands. China and Taiwan claim sovereignty over all the maritime features in the South China Sea. Taiwan is currently in possession of the largest maritime feature in the South China Sea, Itu Aba or Taiping. It is of interest to note that China’s occupation of Paracel Islands was a big surprise to Vietnam. This occurred while China and Russia were both assisting North Vietnam militarily to fight the war for unification of the country. Chinese strategy is to be friendly on the diplomatic front and suddenly occupy unguarded territory. The Paracels were under the control of the South Vietnamese who were fighting alongside the US. On 19 January 1974, the Chinese frigates and submarines duly supported by fighter aircrafts defeated the South Vietnamese in the Duncan portion of the island and quickly secured the entire island. South Vietnam made mild protests which were over shadowed by the major conflict with North Vietnam. The map above shows the Chinese claims based on the nine dash line. China has been aggressively pursuing her claims in the South China Sea. China’s claims are based on the eleven dash line drawn in 1947 by the Kuomintang Government. The claim has been made by Chinese survey team post Second World War who included all important areas of the sea as Chinese. This map was made after China’s victory over Japan and Vietnam was under the French. Philippines was badly shaken by the war and the rest were British colonies. Possibly the Kuomintang perceived that this would remain unchallenged due to the disturbed set of circumstances that prevailed on termination of the Second World War. However by 1953, China had fought the Korean War and Ho Chi Minh with his Vietnamese troops were threatening Dien Bien Phu as also many of the ASEAN countries were gaining independence and viewing these aspects China reduced the boundary to the current nine dash line. Thereafter, China despite strong opposition from Vietnam moved into the Paracel Islands in 1974. China in 1980s improved relations with the US led international community. A global sea level joint observation plan was adopted by the UNESCO Intergovernmental Oceanographic Commission in February 1987, commissioned by the Chinese government establishing five marine observation stations. Nansha station of China is located on the Yongshu reef. In early February 1988, the Chinese launched the construction of NO.74 observatory on Yongshu reef. Vietnam learnt about this activity and its Navy began to patrol the Spratly group of islands. On 13 March 1988, three Vietnamese transport ships arrived at the reef and set up Vietnamese flags. A little later, four large Chinese warships arrived and warned the Vietnamese. The Vietnamese did not respond. The Chinese mobilised more warships and next day early morning despatched 40 marines in three motor boats to physically remove the Vietnamese flags. The Vietnamese held their ground and the Chinese had to return back to their war ships. The Chinese now fired their 37 mm anti aircraft guns destroying the lightly armed Vietnamese on the reef. About 80 Vietnamese soldiers were killed in this skirmish. Thereafter the PLA occupied several reefs in the Spratlys. Vietnam occupied other islands on the reef and the Chinese war ships withdrew to avoid escalation. The Philippines had similar problems with Mischief Reef and Scarborough Shoals which are islands in the South China Sea. Mischief Reef is a large reef in the South China Sea. In 1994, China built structures on stilts during the monsoon season. As the area is about 130 nautical miles from Palawan in the Philippines, they objected as a part of creeping invasion by the Chinese. After negotiations, Philippines did not destroy the structures to avoid escalation and the Chinese continue to occupy these positions. The next area of dispute is the Scarborough Shoal also known as Huangyan Island which is located between the Macclesfield Bank and Luzon Island of the Philippines in the South China Sea. The shoal forms a triangle shaped chain of reefs, rocks and small islands which have a circumference of 55 km and an area of about 150 square Km. The shoal and its surrounding areas are rich fishing grounds. The nearest landmass is Palauig on Luzon island in the Philippines at a distance of 137 nautical miles. China and Taiwan claim that their people discovered the shoal centuries ago and there is a long history of Chinese fishing activity in the area. Philippine legally claims the island based on international law on sovereignty. Philippines proposed to take the matter to the International Tribunal for the Law of Seas (ITLOS) but this was not agreed by the Chinese Government as they wished to resolve it bilaterally. On 08 April 2012, a Philippine Navy surveillance plane spotted eight Chinese fishing vessels docked at Scarborough Shoal. The Philippine Navy despatched a ship which reached the location on 10 April 2012 and found that the Chinese had illegally collected corals, live sharks and giant clams. They attempted to arrest the Chinese fishermen but were prevented by two Chinese Marine Surveillance ships. There were protests by both countries and finally by July 2012 China erected a barrier to the entrance of the Shoal. Chinese surveillance ships have prevented Filipinos from fishing in the area. In July 2010, US Secretary of State Hillary Clinton called for the People’s Republic of China to resolve the territorial dispute. China replied that the US keep out of the issue. The US Department of Defence issued a statement on 18 August 2010 where it opposed the use of force to resolve disputes in the South China Sea and accused China of assertive behaviour. Issues kept simmering and in May 2011, Chinese naval ships attacked and cut the cable of a Vietnamese exploration ship. On 01July 2013, US Secretary of State John Kerry asked all nations to resolve the disputes in the South China Sea amicably. This was accepted by all members and China has emphasised that bilateral solutions will be found. On 22 July 2011, INS Airavat, an Indian naval amphibious assault ship was on a friendly visit to Vietnam. The ship was repeatedly contacted at a distance of 45 nautical miles from the Vietnamese coast on an open radio channel by a vessel identifying itself as Chinese Navy which warned the Indian ship that she was entering Chinese waters. Indian Navy clarified that no ship or aircraft was visible from INS Airavat and the ship moved on without paying any heed to the cautionary warning. Further, India clearly stated that she supported freedom of navigation in international waters including the South China Sea. India and Vietnam signed an agreement seeking to contain a dispute over the South China Sea in September 2011. Further, Oil and Natural Gas Commission’s (ONGC) overseas investment arm ONGC Videsh Limited had signed a three year deal with Petro Vietnam for developing long term co-operation in the oil sector. Further it had accepted Vietnam’s offer of exploration in specified blocks in the South China Sea. This was met with stiff opposition from China who claimed that no exploration could be undertaken in areas over which China has sovereign rights. The Government of India correctly responded by stating that while China had concerns but India was going by the agreement signed with Vietnam. The Chinese claim was rejected by both India and Vietnam. As per the UN, the area of exploration belongs to Vietnam. India has firmly stated that ONGC will continue to explore oil in the South China Sea. Further India has clarified that the entire Indian Ocean region stretching from East African coast to South China Sea remains crucial to its foreign trade, energy and national security. Vietnam has remained steadfast on the issue and in July 2012 the National Assembly of Vietnam passed a law demarcating Vietnamese sea borders to include the Paracel and Spratly islands. The latest development is the setting up of a prefecture by China by the name of Sasha in the Paracel islands. On 24 July 2012, the city was formally inaugurated as the centre of Government for the Spratly and Paracel islands. The government offices are located at Yongxing (Woody Island) on which some 1000 civilians currently reside. The island is the biggest island in the group and has an area of about five square miles. The island is served by an airport which was completed in July 1990 with a 2700 metre runway. It is capable of handling the Sukhoi Su-30 of the PLA Air Force. There is also a Coast Guard station and a hospital. While Vietnam strongly contends that Paracel and Spratly islands are their territory, the Chinese have left no stone unturned to build infrastructure for militarily occupying these islands. All countries particularly US and ASEAN want the issues to be resolved peacefully. China has been dealing with the issue bilaterally without any success. Its occupation of territory by force is challenged particularly by Vietnam which has demonstrated their military capabilities and would counter use of force judiciously. The obvious question that arises is what the options for resolving the issue are. Broadly there are two options. The first is to resolve the problem through negotiations bilaterally or multilaterally. 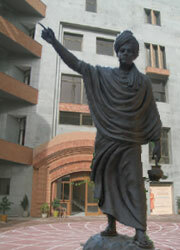 In the event of no success during negotiations, the parties could resort to other modalities of dispute settlement such as conciliation, arbitration and adjudication. This is a sovereignty dispute and it would be difficult to refer it to any form of third party without the consent of parties. Further, China has exercised her right under Article 298 on UN Convention of Law of Seas to opt out of compulsory binding dispute settlement. Therefore, the case cannot go before the International Tribunal for Law of Sea. The other option would be to set aside sovereignty issues and to undertake joint development of disputed areas. Joint development has produced tangible results between Malaysia and Thailand (1979-1990), Malaysia and Vietnam (1992) as also between Australia and Timor Leste (2002). This issue can be applied to Disputed Areas. However, China has yet to clarify its claims. Thereafter the aspect of Joint Development could be analysed. Vietnam is the only country which has physically fought the Chinese on these islands and would not bow to China over their claims. While China holds the key to resolution of problems in the South China, it is pertinent to note that China resolves a border problem only after protracted negotiations so as to exploit time to its advantage. Paracel Islands was secured in 1974 by China without worthwhile opposition from Vietnam as they were involved in the war for unification. They would like to get a clearer perspective of hydrocarbon availability prior to clarifying their claims. Out of all the other claimants, Vietnam would fight for its rights and settle for a judicious resolution. The new Chinese leadership has been assertive on both the East Sea and South China Sea claims. Vietnam and Japan have strongly opposed China’s aggressive behaviour on these disputes. Both these countries are developing intense strategic partnerships with India to counter China’s assertive posturing. India on her part has spoken of freedom of navigation in the high seas. Further, Vietnam insists that India continue offshore drilling in the blocks allotted despite Chinese opposition. Resolution of disputes in the South China Sea would depend on China’s keenness to clarify its claims and peacefully negotiate with other claimants. This would possibly occur once oil exploration results are available possibly in about another five years which would allow China to provide space to other claimants leading to rapprochement between the contestants to these territories. India has taken a correct stand to explore oil in the region and should remain firm on this aspect. This would send a signal to China that it is dealing with a country that can stand up to China for projecting her energy interests. Currently all claimants must be patient and wait for China to see issues in the correct perspective.